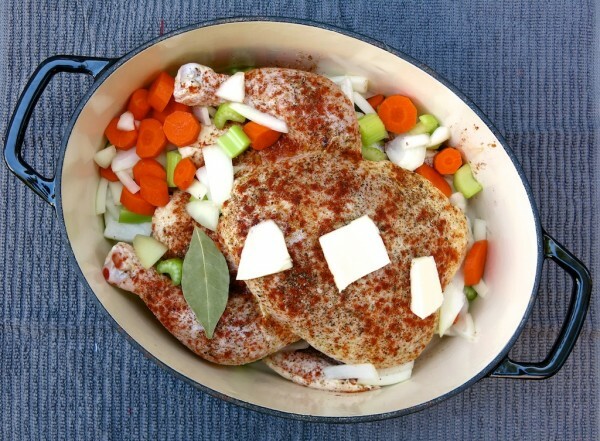 I took my new Cuisinart Cast Iron Dutch Oven for a test drive the other day. 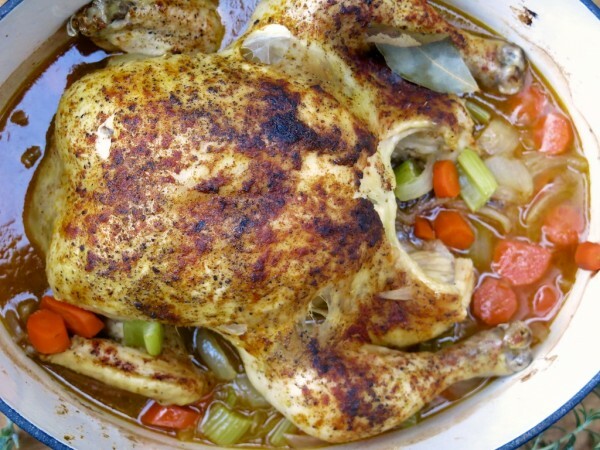 The results: one moist and delicious roast chicken! The preparation was super easy. After preheating my regular old kitchen oven to 375F, I drizzled some olive oil in the bottom of the Dutch oven. Then I rinsed the chicken under cold water and patted dry. I also threw out the neck that was inside. If you are into chicken necks, then by all means, do your chicken neck thing. I personally think they are a little icky, hence the immediate placement in the trash. After the chicken was clean and dry, I sprinkled salt, pepper and paprika on the back side. After flipping the bird (HA! that joke will never get old to me) breast-side up, I sprinkled more salt, pepper, and paprika, and patted some butter on top. Then chopped carrots, celery, and onions were added to the pot. Finally a bay leaf was thrown in the mix before covering the Dutch oven and placing inside the regular oven. At first we covered the pot with foil, because the knob that is on the lid is only heat safe to 350F. Then we realized that the knob screws on and off quite easily, so we simply removed it and used the lid. We had to be a little cautious when removing the hot lid, but for the most part, it worked great! We let the chicken do its thing for about an hour and a half. I am not sure of the exact time because we were using the meat thermometer to assess when the chicken was done. We took the top off for the last 5 or 10 minutes to let the chicken brown up a little. After removing the chicken from the oven, we let it sit a few minutes before serving. And I took all that glorious broth that was still in the bottom of my Dutch oven and made chicken soup! It was great because it was all in the same pot so the mess was minimal. I am definitely lovin’ my new Dutch oven! 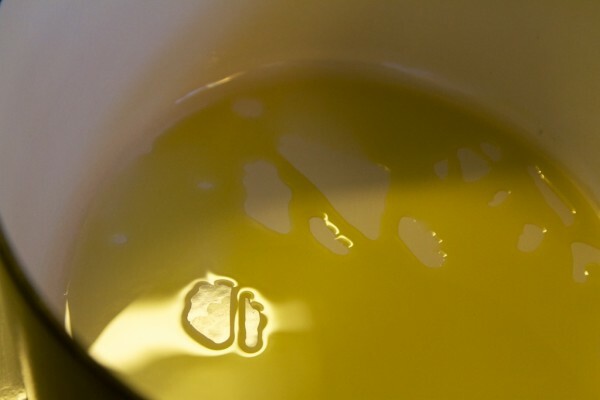 Drizzle olive oil in bottom of Dutch oven. Rinse chicken in cold water. Pat dry. 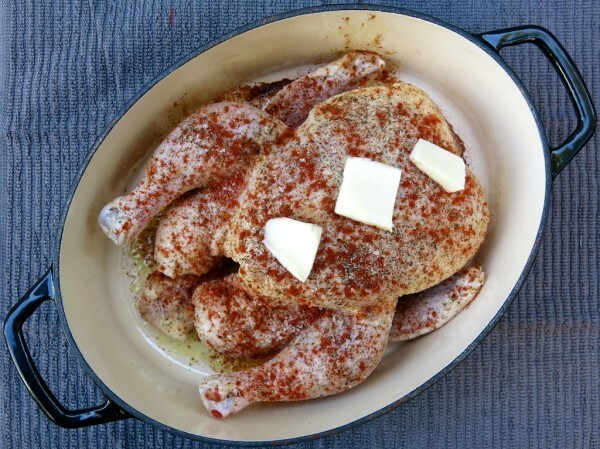 Sprinkle salt, pepper, and paprika on both sides of the chicken. Place chicken breast side up in Dutch oven. Add vegetables and bay leaf to pot. 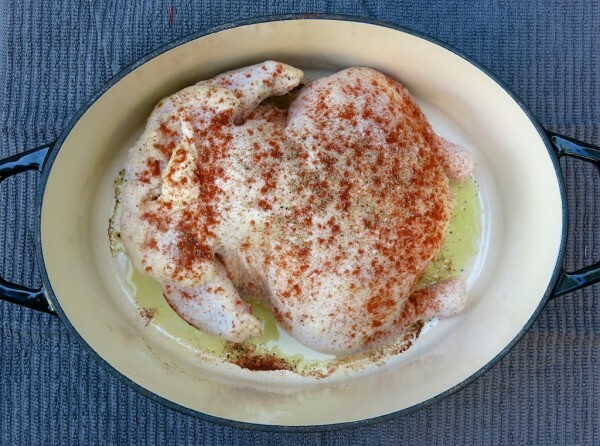 I have googled ‘perfect roasted chicken recipe’ before and I will get: ‘place chicken on rack in the middle of the oven.’ This will get you a really messy oven and smelly house for about a week, and it won’t be tender. 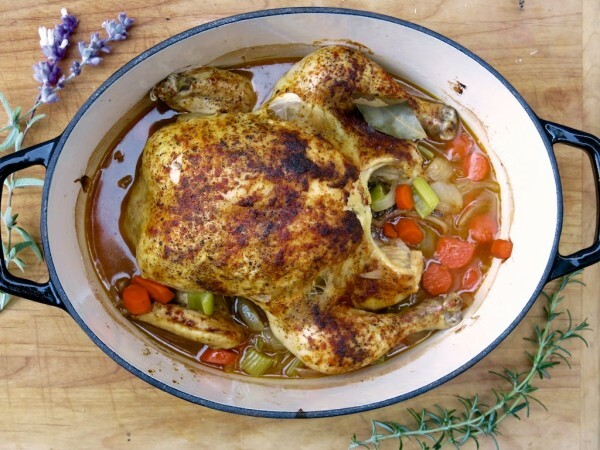 Your recipe is a more dry technique that yields a tender chicken and a wonderful gravy/juice that doesn’t separate. I loved it, my husband REALLY loved it. And thank you for specifying ‘breast side up.’ This is a keeper and it goes into my rigorously hand selected dinner menu rotation.